It has been quite a year with one thing and another and I am afraid my blog has suffered because of it. Thanks to everyone for all the nudges to get posting again! So it's time for a catch up! It was our Golden Wedding Anniversary in August and on the day itself we just went up to Crummock Water and had a picnic. We have been so fortunate to have had a happy,whole half century together. The weather was kind and there was a "glass on the water"------pure magic! The fantastic summer we have had this year was just what was needed to get things growing again along our river wall after the rebuilding work. 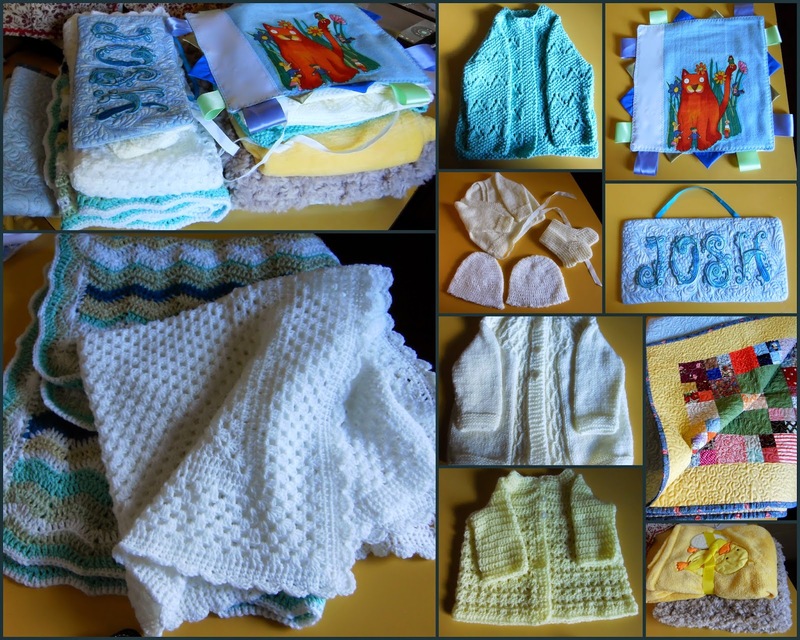 Because of the weather we have been outside a lot but I have still been sewing, knitting and crocheting. This was my contribution to the P&Q magazine's 250 Shades of Red competition. It is pictured in this month's magazine. This is a clothesline basket made just to prove to myself that my Bernina really can sew rope! Would you believe there are 25 yards of rope in it? 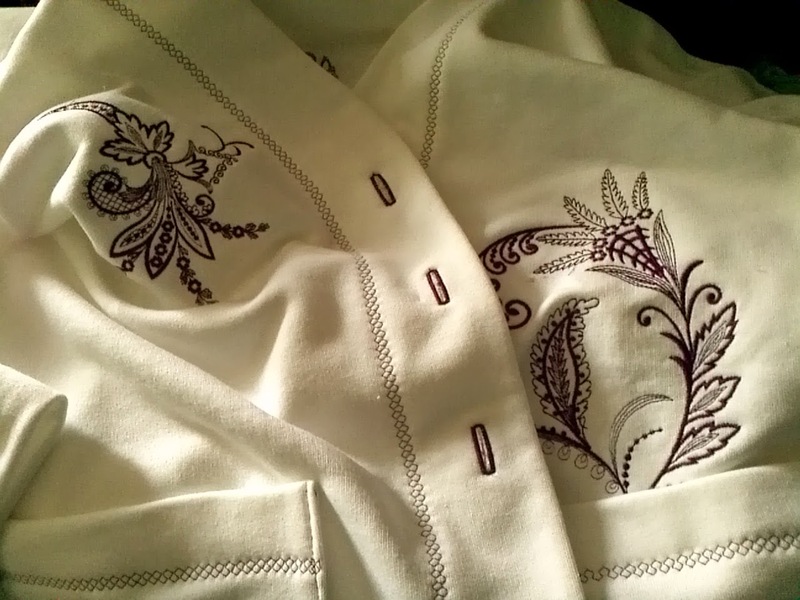 Came across some white sweat shirting fabric in my stash so used some of the lovely Paisley patterns in my Bernina 830 on the fronts and back of a jacket. 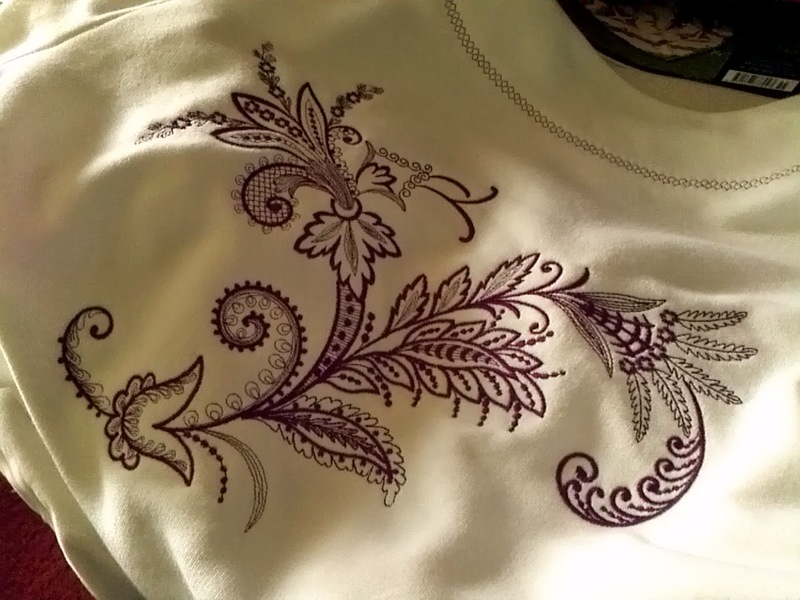 When it was done I popped it in the washer and dyed it a sort of dark dusky pink so that the embroidery is now tone on tone. I rarely use patterns for quilts but Love Entwined caught my imagination as it is based on an C18 coverlet. Our house is at least as old as that so I thought it would fit right in even done in more modern colours. 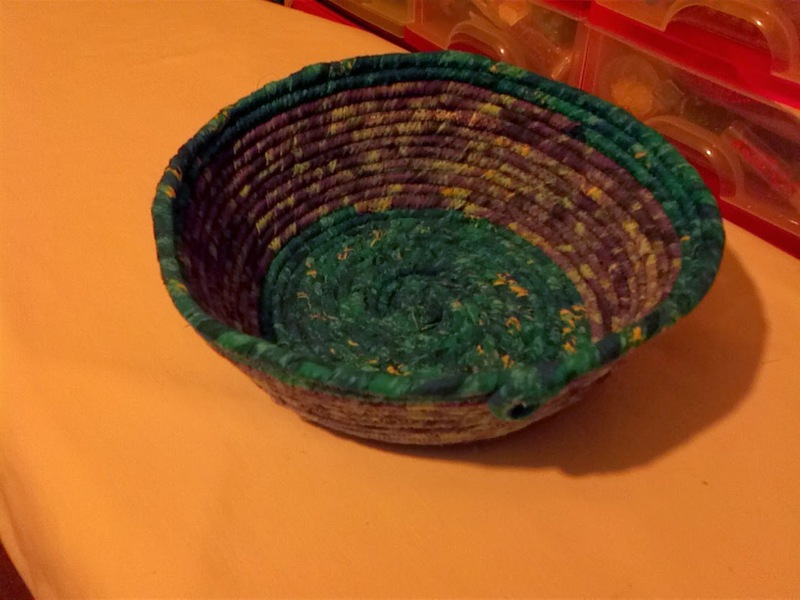 The pattern is all still freely available thanks to Esther's generosity. I am amazed that I have nearly finished it and also how big it is! Would you believe there is a three seater sofa hidden under it on the above picture! Last corners ready to add. Also downloaded a pattern for Bionic Gear Bag from Craftsy. 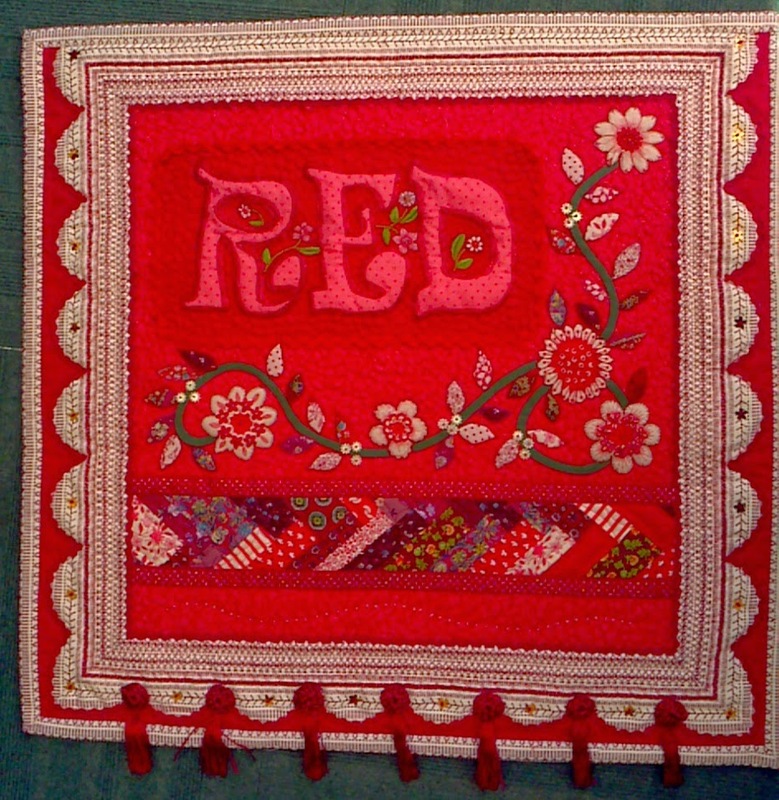 It gave me opportunity to use fabric on which I had tried out one of my own applique designs that was just the right size! It gave plenty of practice on inserting zips as well as making inroads into my stash! Love all your work, especially the multi-pocket bag. Brilliant! Hi there, so glad your back have missed your wonderful views (Sigh! will I ever get to Cumbria? )and all the projects you make. So pleased to have you back again. Love the work you have done! Lorraine----hope you manage to get to Cumbria one day. We are very lucky to live here and have it all at our door!